Join the Mages Guild and earn recommendations from all guild leaders to gain access to the Arcane University. Robe of the Apprentice, access to the Arcane University. Talk to the head of any Mages Guild to join. Gain access to the Arcane University. In order to join the Mages Guild, seek out a local head of the Mages Guild in any of Cyrodiil's seven guild halls. There is one in each city except for the Imperial City and Kvatch. All you need to do is ask to join the guild; as long as you have a clean criminal record you will be made part of the guild. You will be given a copy of the Mages Guild Charter and a Mages Guild Key that opens most of the doors in the seven guild halls. You are also now free to take almost all of the items you find in the guild halls and sell them for quick cash (there are still however a few privately owned items that cannot be freely taken, so pay attention to your icon before picking something up). Note to avoid confusion: This quest is instead known as Fingers of the Mountain if the PC-only Unofficial Oblivion Patch has not been installed - however, it still functions as the Chorrol Recommendation quest. Once you have all seven recommendations, speak with Raminus Polus at the lobby of the Arcane University in the Imperial City (at least during operating hours). He'll acknowledge receiving all the necessary recommendations and accept you into the guild, promoting you to the rank of Apprentice. You will receive an extra Fame point (in addition to others gained completing the above Recommendation quests), access to the Arcane University, and a Robe of the Apprentice. Although you can get inside the gate to the Arcane University by tailgating one of the NPCs that opens the gate to enter, you cannot get into the actual buildings without performing this quest and receiving all seven recommendations. An achievement will be unlocked upon joining the Mages Guild and upon being admitted to the Arcane University. 10 I have been told if I wish to join the Mages Guild, I should speak with the head of any of the local guild halls in Cyrodiil. 21 I have spoken with Carahil in Anvil. She has told me I must not be a wanted criminal if I wish to join the Mages Guild. 22 I have spoken with Kud-Ei in Bravil. She has told me that in order to join the Mages Guild, I must not be a wanted criminal. 23 I have spoken with Jeanne Frasoric in Bruma. She has told me I must not be a wanted criminal if I wish to join the Mages Guild. 24 I have spoken with Falcar in Cheydinhal. He has told me I cannot be a wanted criminal if I wish to join the Mages Guild. 25 I have spoken with Dagail in Leyawiin. She has told me that in order to join the Mages Guild, I must not be a wanted criminal. 26 I have spoken with Adrienne Berene in Skingrad. She told me I must not be a wanted criminal if I wish to join the Mages Guild. 50 I have joined the Mages Guild. I must acquire recommendations from all of the local Guild Hall leaders in order to gain access to the Arcane University. 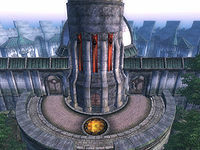 90 I have received recommendations from all of the local guild halls in Cyrodiil. I must now travel to the Arcane University, and speak with Raminus Polus. 100 Finishes quest I have been given a recommendation from each ranking member in the local guild halls, and have been given access to the Arcane University. It is possible to use the console to advance through the quest by entering setstage MG00Join stage, where stage is the number of the stage you wish to complete. It is not possible to un-complete (i.e. go back) quest stages. See SetStage for more information. This page was last modified on 8 January 2018, at 19:09.